The Hollow Vindication of Edwin Armstrong. History is littered with biographies of brilliant geniuses who let their personal struggles ruin them. The storyline is an old bit: Unable to handle success, they become a party to their own undoing. A twist on this story are the geniuses who kept their personal conduct on the straight and narrow but were ruined by others. Edwin Armstrong is such a person. His story teaches that great people often have poor coping skills and do not surround themselves with other great people. Edwin Armstrong (1890-1954) is not an everyday name but we all benefit from his contributions, every day. 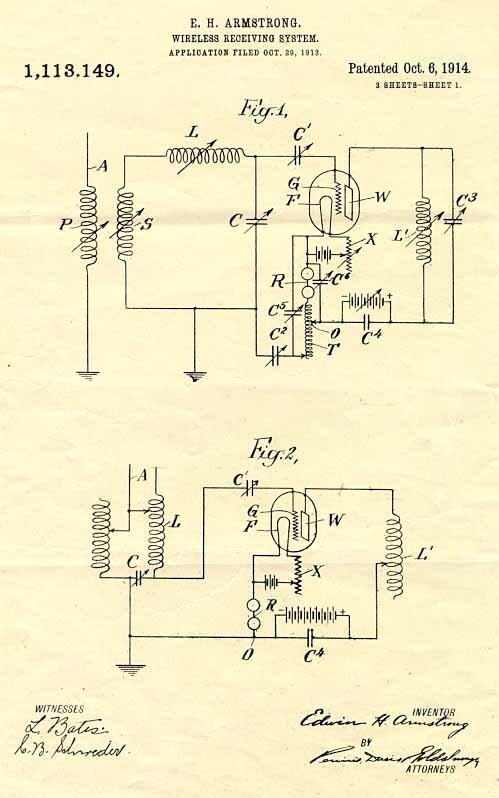 He was an early radio pioneer who developed regenerative and superheterodyne receivers. The technical details of these inventions are not the point of this article, but trust me when I say that all our lives are better because of them. Edwin Armstrong also invented FM radio. Yes, the same FM radio that’s in your car and home and everywhere. One unusual Armstrong accomplishment was proving the capabilities of a device he did not invent. The Audion tube (later to become the vacuum tube found in old electronics) was invented by Lee DeForest but it was Edwin Armstrong who did all the subsequent research that led to the practical uses of the tube. DeForest did not even understand his own invention! But Edwin Armstrong is most known for inventing FM radio, and that’s where his life took a horrible turn. After years of hard work and spending a lot of his own money to build FM radio into something practical and useful, the tables were turned on him when the Radio Corporation of America (RCA) successfully lobbied the Federal Communications Commission to move the FM radio band to a different range of frequencies to make room for television, which was a nascent medium. At the stroke of a pen, all existing FM receivers and transmitters were rendered obsolete. RCA then claimed that they, not Armstrong, had the patent rights to FM radio. A huge court case followed. By any measure of fairness, Edwin Armstrong got royally screwed. But as my very wise & street smart father once told me, the courts don’t do what’s fair. They do what’s legal. Armstrong spent most of his career in litigation defending his patents and lost nearly every case he was involved with. One of his close associates stated that Armstrong spent more time dealing with his legal issues than he did actually researching radio. Edwin Armstrong’s extensive personal and professional troubles ended on January 31, 1954 when he committed suicide by jumping out the window of his New York apartment. Decades of business related acrimony and legal strife was too much for him. The epilogue to this story is where the lesson lies. Edwin Armstrong eventually won his lawsuit with RCA. The court vindicated him as the true father of FM radio, but there was no “making him whole” in the legal sense because by then he was dead. His heirs collected a monetary settlement in the millions, but riches mean nothing to a dead man, and they mean barely more than nothing to the surviving family. Unlike celebrity deaths willfully caused by a wild lifestyle and substance abuse (which might be considered a form of suicide), Armstrong badly wanted to live the serene life of a scientist and was battered by forces outside himself. We can’t control everything that happens to us, we can only control how we react to it. It’s unfortunate that Edwin Armstrong, for all his technical prowess, could not master this common and very effective psychological defense mechanism. Armstrong was killed by his inability to choose good people to do business with and his inability to find a better way to deal with the trouble that seems to follow extraordinary geniuses no matter how hard they try to live an ordinary life.